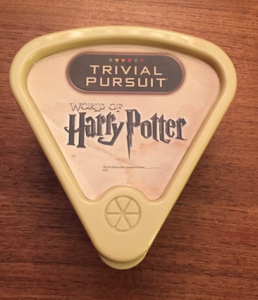 A Game for Summer: Trivial Pursuit’s World of Harry Potter! USAopoly and Hasbro have developed a World of Harry Potter version of the classic Trivial Pursuit game. For fans of Trivial Pursuit and fans of Harry Potter, there is fun in store for players of all ages and with all levels of Harry Potter knowledge. This Harry Potter version of Trivial Pursuit is a perfect game for summer–whether it is family game night, burning time while traveling to exciting destinations, challenging your friends to see who knows the world of Harry Potter best, or following your roommate around the house spontaneously shouting questions at them (guilty), there are many ways to enjoy this game. 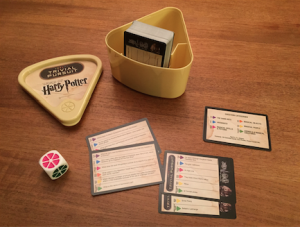 The World of Harry Potter Trivial Pursuit is made for easy clean up and travel. The pieces of this game include a deck of cards and one dice–yes, that’s it–stored in a pie-shaped wedge container that takes up very little room. If you choose to play by the rules, the object of the game is pretty simple: be the first player to collect 6 cards. To win six cards, you roll the colored dice, answer the corresponding question; if you answer correctly, you roll the dice again, and answer a Wedge question. This repeats until you answer incorrectly, which ends your turn. 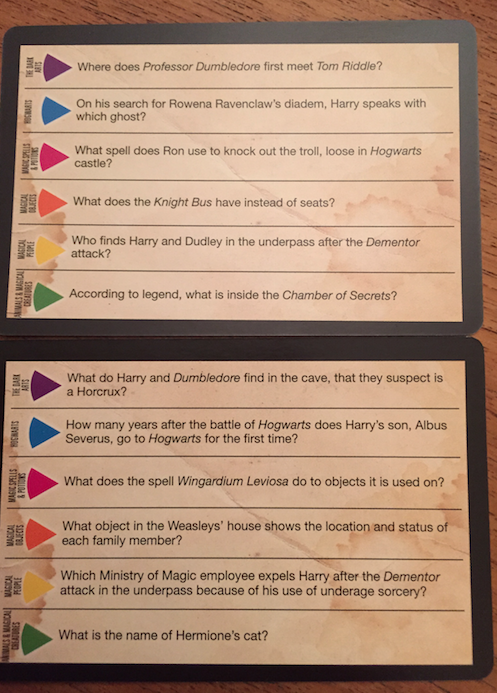 To win 6 cards, you must answer 12 questions correctly. 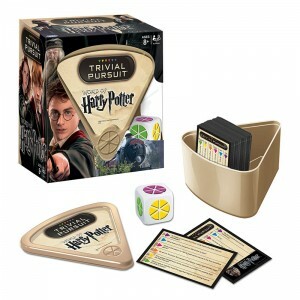 For lightning rounds, you could win a card by answer one question correctly; for longer games you can add the cards as an extension pack to the classic Trivial Pursuit board game and play the standard board game. Or if you’re like me, you can just rattle off questions to your friends who claim to be Harry Potter experts, and claim eternal bragging rights and glory when you get more of them correct. 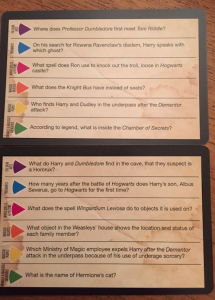 If you are looking for a little bit of fun to add to your summer, keep this slice of Harry Potter Trivial Pursuit in mind. If you can answer all 12 questions (pictured below) correctly, I’ll give you a shout out on Leaky NO CHEATING! (Click on the photo of the playing cards to enlarge the picture).